A circle is formed by the party guests with one child in the middle. 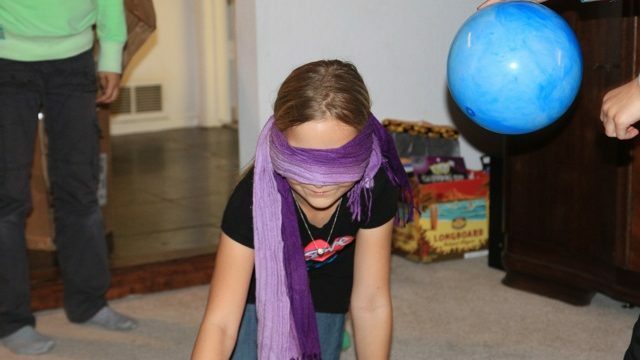 That child is the seeker and wears a blindfold. The other kids turn the seeker around 2 or 3 times, in order to lose orientation. Meanwhile, the birthday child hides a small cooking pot somewhere in the same room. There is a prize inside the pot (or under an overturned pot). The seeker is then given a wooden spoon and told to start looking. The seeker must crawl around the floor, banging his spoon on any object he comes across. The other children help by crying out “warm,” “hot,” or “cold” depending on how near or far the seeker is from the pot. When the seeker finally bangs on the pot, it will make a distinct clanging sound and he’ll know he’s found it. 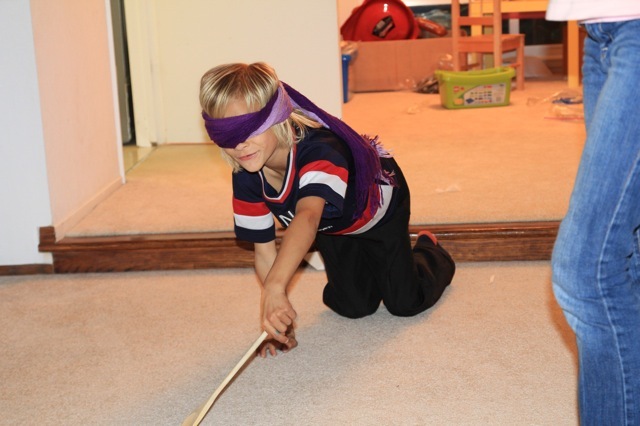 He’s then allowed to take off his blindfold and claim the prize in the pot. The game is played over again until everyone has had a turn and found a prize. Success! 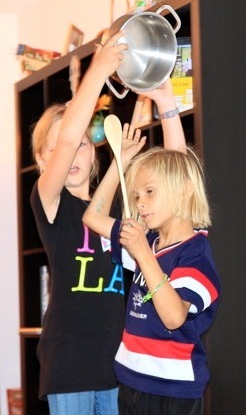 Not sure what sister’s doing with the pot..
Do you have any unusual birthday games you’d like to share? Please comment below!